The development of Crook: using trade directories. Trade directories first appeared in the 17th century but they didn't become commonplace until the 19th century. As might be guessed from their name, trade directories at their most basic were just handbooks containing the names of all the people involved in commerce in a particular place. Trade directories were used by commercial travellers (salesmen) who toured round hoping to sell their goods. When trade directories first started to appear, most were produced locally by independent publishers. By the latter half of the 19th century their production had become dominated by big publishers or companies such as Kelly's, the Post Office and Pigot who found it easier than the smaller publishers to collect the information. 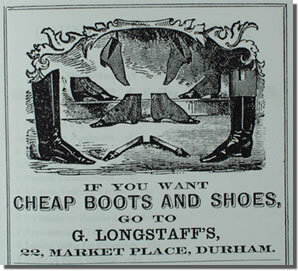 Advert from an 1860s trade directory for Durham. (Image from Durham University Library). Why are trade directories useful? Historians find the information in trade directories very useful. In addition to providing details about the trade and service industries of the town, most directories also carried information about life in the locality and a brief local history. The directories carried adverts for some shops and services which may not have survived in any other form. Trade directories were also published reasonably frequently so it is possible to use them to fill in gaps between censuses. 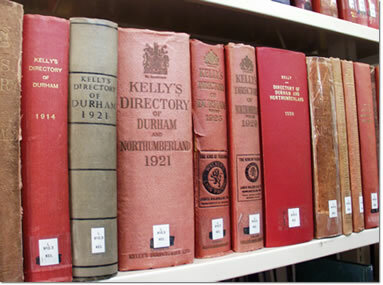 If you want to find trade directories for your own locality contact your local library or county record office for advice. Now that you've found out a little bit about trade directories, discover what they can tell you about the development of Crook by comparing the entries for 1858 and 1902.